A few weeks ago we shared the latest plans for MyMagic+, and gave a look at more changes to come. We saw great response and interest in the news. Many of you expressed excitement about the evolution of FastPass+ and the fact that we were working on ways to provide our guests with the ability add more FastPass+ entitlements in addition to the three they can plan in advance and a feature that enabled the ability to make those additional selections while park hopping. And we are pleased to let you know that as of next week our guests will be able to do just that. So starting Monday, after guests have used their first three FastPass+ selections, they will be able to select another one at one of the kiosks located in each of our WDW parks. When they’ve used that one, they’ll be able to select another, and so on, ultimately providing guests with even more ways to customize their Walt Disney World Vacation. Guests will also be able to select and use their additional FastPass+ entitlements when they hop from park to park. As we’ve said from the beginning, MyMagic+ will continue to evolve over time with the aim of continuing to improve our guests’ experience with us and in response to feedback from our guests. Today’s news is another chapter of that story and we look forward to sharing more with you as we continue to roll out and refine MyMagic+. Continue checking the Disney Parks Blog for more details. Hi! I added a friend to my Disney account, but I like to undo it. Is it possible? Question…what if you only make 2 fast pass selections for a day…can you then select one at any park at any time for that 3rd one? Say I have 2 late night fast pass selections for Magic Kingdom…but no 3rd selection…can I get a fast pass from say Hollywood Studios earlier that day or would it have to be from Magic Kingdom? After I use my initial 3 FP+, can I use a kiosk at that park to select an additional FP+ attraction at another park that I’m heading to, or do I have to wait until I get to that park and use kiosk there? If I make fast pass reservation on line how can I change it if we decide to switch to another time or something else? Thank you for continuing to improve and for continuing to communicate to your customers! We look forward to our visit in June! Jason, I understand that they just started adding charging stations this week. They are like little lockers where you can plug in your phone, close the door, and leave it for a while to charge in a secure lockbox-like place. I believe they are in the gift shops. The BIG question of the week is, “how is it going??? ?” This was day 3 of the new rolling fast pass system. Has anyone used it? Were you able to get 4th, 5th, 6th fast passes for any top tier rides? Are the kiosk lines still longer than the rides’ stand-by lines? Please, someone, report back. Thanks! JASON: Search this on the ‘net because I know I read about stations in certain areas of the parks. I seem to recall some comment about spots in the play area of the Dumbo queue. I may be wrong. I was there in early April and carried my cord every day just in case but never actually got below 20% so I didn’t look. We had park hoppers and I worried about only having FP+ in one park but it actually seemed to work out for us: lines were really short during the late hours at MK and that meant we did many of our “must do” rides that night without FP+. The longest line/wait of our whole trip was Rockin Roller Coaster at Hollywood and it was only 60-70 minutes compared to the 90 minute wait we’d had 3 years ago. There was one time in one of the parks when we rode in stand by because it was actually a better wait and use of our time than waiting for the fP time so we just changed the FP selection via the app while walking through the standby line! Only real issue was the connection issues with the wifi system in the parks/resorts – I think I used more battery waiting for pages to load in the app than actually doing what I wanted with the app. Ok so with all this revolving around using our smart phones does Disney have any intention of putting charging stations in the parks at all for cell phones? Nice. That was one of the negatives I noticed right away. On a slower day, you could have used fastpasses all day long in the past. This will open that idea up again, and still be more convenient than going to the actual attraction entrance to get the slips of paper. Are there any plans for a system to allow those that do use a FastPass+ for an evening event, or just an attraction that might not even have an opening until later in the evening be able to acquire an additional fastpass+? Because this limitation really makes booking fireworks or an evening activity a real disadvantage for the guest with the new system. Don’t get me wrong it’s great that you can now get additional FP+’s, but if you can’t book an evening activity and get an extra 1 you really have 2 options: 1)don’t book anything for the evening and hope that after you use your 3 early in the day an evening Fireworks spot is still open, or 2) Hold your spot for Wishes/Illuminations and only be able to use 2 FP+ during the other 10-13 hours the park is open before the nighttime activities. Again I think it’s great you can now get more than 3 fastpasses, but now you have to weigh what you want to do more: more rides and shows, or hold a spot for wishes? I was wondering if there will ever be a way to use the band and track others that are included in your reservation by locating them via a phone app. Would be a great way to find your older children or family members in a busy park. I definitely think this is great and a step in the right direction! I love that Disney is always evolving and trying to make sure each guest has the best experience possible. I do have to agree with the other people who have noted that if you have a late FastPass+ to Illuminations, Wishes, etc… this won’t really benefit you much. I would love to see those type of reservations be different than the FastPass+ reservations. This sounds great! Some friends of mine have Epcot after 4 pm passes. Are they able to use FastPass+ for their evening adventures? Some of my fastpass selections are the 9:00 parade and fireworks. Even thought the parks are open later than that, I have little kids who will be maxed out by then. The new rule would in essence preclude me from taking advantage of that change because we will be leaving after the 9:00 events. Is there any plan to modify the new rule in those instances? This sounds like a really good plan. I think MyMagic+ has been the best thing to happen to WDW in a long time. And this seems like a really good balance to letting people plan ahead without overwhelming the system so much that fastpass and pre-planning become meaningless. Just got back from WDW, and loved the Fast Pass+ feature!!! We heard that this would be coming, and I am so excited as I have plans to return for a week in July!!! Being able to use the My Disney Experience App would be awesome though, as the kiosk lines were very long 🙁 Seems silly to wait in line to not have to wait in line…. This is a good start to transforming the system. People who use one of their 3 starter Fast Passes for, say Illuminations for example, won’t get any more extra Fast Passes for the day. This is a vast improvement, but I also remember those Kiosk Lines being 30 minutes long or longer. Hopefully they add more Kiosks. Do you have to be staying at a WDW resort to be eligible for the FP+? That’s great …but a week too late. Nice plan though, I think people will really like this new plan. I’m curious, will we be able to use a kiosk at one park to set up a FP+ for an attraction at another. For example, if as we were leaving Magic Kingdom, set up a FP+ for EPCOT, or will we have to wait until we get to EPCOT and find a kiosk there? Very Happy that Disney has made this improvement to Fast Pass +. My honest opinion is that this won’t add anything. Fastpasses are gone for the main attractions a few days before the day you actually ride them. So, the only things that will be left for a 4th, 5th, 6th FP are Dumbo and that type of ride. I believe that letting us book several FP’s before we arrive is how it should be. Make a time lockout so that we can only use one every 90 minutes or something like that but we need to be able to reserve before we get there because the good ones are all gone on the day of. I will say that this is actually make the lines even out a little bit because the main lines that say 70 minutes were really only 40 minutes when we were there in February. Tom- Thanks for listening to your guests and allowing for additional FastPasses in the park. This is what we love about Disney. Every time we visit, we feel like every effort will be made to make sure we have a magical visit. 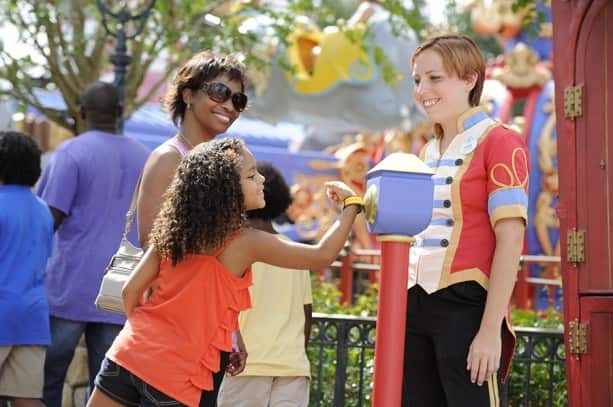 I’m so excited about MyMagic+ and the FastPass+ system. I visited the Walt Disney World Resort in January and was able to utilize the system, it was amazing. I hope it comes to the Disneyland resort very soon. In my opinion, you should be able to schedule another as soon as you use one, thus always holding no more than three passes. I love the nighttime fireworks and parades! There is nothing more frustrating than being packed like a sardine to view them (if you can even see the parade without holding a child). I want to keep the fast passes for my favorite night entertainment and still be able to use this new feature!!! I’m happy to hear this news. We just returned on Saturday night from a 5-day trip. I was displeased at the way the system worked because we paid extra for the park-hopper addon to our tickets, yet by using that option, we were sort of penalized when it came to attractions in the non-preplanned park. If this wasn’t changed by our next trip, we were considering not spending that extra money and staying with a 1-park-per-day ticket. There were also situations where in order to get 2 FastPasses for attractions I wanted to see at the times I needed, I had to choose one that I knew I couldn’t use because it conflicted with a dining reservation. Getting a 4th would mitigate that frustration. Tom, This is great news. But it would be good if the nighttime shows such as fantasmic and wishes did not have to be used before you got your next one. In Disney California the World of Color FP does not count within your allocation which is great. I was pleased to see you added the 4th pass as an option but even more pleased that it is allowed in a second park. Will be curious to see whether there is anything I want to ride left in the second park – but am feeling very open-minded. We have an annual pass and am delighted to be able to ride Soarin and Toy Story Midway Mania at a reasonable hour on a regular basis without having to get to the park very, very early. I agree that it’s silly to require people to book the second tier FP when they don’t really want them – but that’s easily resolvable by booking those unnecessary FP for earlier in the day and just letting them age out. Thank you for making my annual pass even more valuable than it was before. So… if I use one of my 3 FP+ reservations for the night time parade or fireworks, that means I can’t get a 4th FP until very late. That’s not good. Also, why make guests stand in yet another (new with FP+) line? Use technology to make it easier: we should be able to schedule a 4th FP using the myDisneyExperience app, not stand in another line. At least you’re finally allowing park hoping. Say you only schedule 1 fast pass ahead of time once you use that can you get one from the kiosks then? I’m mostly interested in that aspect at Epcot – I’m wondering if I can schedule on for Soarin then go get one for Test Track 🙂 Thanks! What if you only want to use 1 of your original 3 allotment at 1 park and the other 2 at another? My daughter is 3 and under 40 inches. She loves Toy Story Mania, but that is pretty much the only attraction in the Studios we use the FP+ option for. Could we use the other 2 leftover slots for Magic Kingdom immediately? So, is there a similar process for handicap access que. Our last trip to DL had cards that we had to visit ‘green’ umbrellas to get in the queue and come back after x time. Still really disappointed that you have to use all three of your scheduled FP+ before you can select a 4th. For those who scheduled a late FP+ (like for fireworks), they will not be able to select a 4th. It would be great if you could select a 4th FP+ after you use your first scheduled FP+! Please keep listening to guest suggestions to make FP+ better for all! Thanks!! The question I have concerns the Magic bands. We visited WDW in December 2013 and had a wonderful Christmas time and we still have those bands. Just wondering, we are coming back in September 2014 and plan on staying on property like we always do for the convenience and extra magic hours and want to know if we can still use the magic bands we have. I bought an extra 10 day pass last time and didn’t get to use it because I still had an extra 4 days from a previous pass. Also, I always purchase the no expiration option. This is great news! I love how the new system is working for my family. The ability to add more FASTPASSes will make it an even better experience for us. Definitely a step in the right direction. We visited Disney just before this change, and I wasn’t a fan of the new fast pass system. I have linked to this post from my recent blog post about our trip. It’s a bit of a bummer that you can’t get a 4th without using the 1st 3. If you have late night events (Wishes, Illuminations, etc) scheduled, you’re ‘stuck’ at 3. Maybe dropping to 1 or 2 for pre-order, then keeping the old system around for “day of” fast passes might be another alternative. I am wondering if cast members will still be able to pass out fast passes as a courtesy? Several times over the years, a nice waiter or other cast member gave us “use anywhere/anytime” fast passes as an apology for some mishap. It was like winning the lottery, and it always erased any memory of the mishap! Disney should find a way to retain this little perk. I’m also sad realizing that we will no longer experience the joy of handing our unused fast passes to a stranger. Those little papers were a sort of currency of kindness, and I will miss them. I am also wondering if the magic bands are share-able? In the past, we have used our family’s 6 tickets to get, say, 6 Rock-n-Roller Coaster fast passes which would then be used by our three teens to ride twice in a row. Could we do the same thing now by swapping bracelets? What if we have already reserved our FastPass+’s under the prior system where we had 3 per day? They are still showing up under My Disney Experience, but are they valid? That is, after the 3 we have reserved for the first day, are the subsequent days’ reservations valid? Does this extra attraction reservation ability also apply to guests at the swan and dolphin? Thank you so much, for letting us know this is rolling out! We’re coming to Walt Disney World, for our 5th Wedding Anniversary, on the 11th and are going to be so happy that we’ll get to use this set-up while we’re there! As MyMagic+ continues to be improved, have patience folks! The cast members are learning how to use it too. The only problem I found in March was that some cast members were still learning how to balance the FP queues with the standby queues, but that will come with time and experience. Between FP and the new interactive queues plus a little planning makes a day in the parks more efficient than ever. Any word on whether annual pass holders will be able to reserve more than 7 days’ worth of Fastpasses in a 30-day period? I was kind of bummed when that restriction was placed on pass holders. Once I used all my Fast Pass Plus reservations and want to get another one at a kiosk, can I get a FPP for any park or only the park I am in? Thank you Disney! Having the availability for early rising planners AND those who sleep in to roll in later to enjoy touring the way they like is great! I think this is still a work in progress, and as Disney gets feedback from guests, they’ll continue to adjust. What I’d like to end up with is a system where I can have a maximum number of daily FP+ options, but no minimum, where my options include park-hopping whether morning or evening, and where all options are able to be selected via your app or your website. Kiosks should be only for day guests who don’t keep up with what’s going on and don’t know what a FP+ is. I think this is what we’ll see eventually (I hope).